problem? -Any suggestions as to how I may handle it? That's odd for sure. You are on the right track, but may never be able to re-use it. 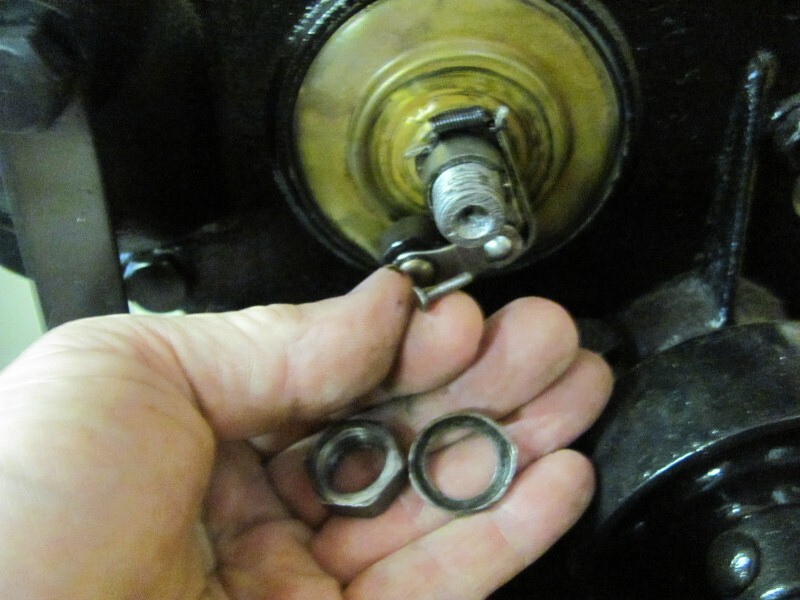 You have lever or pull out that 'nail' and lift off the 'cap' and pull the rotor off the cam shaft. Typical Ford stuff comes off easy. The early rollers used a straight pin. The camshafts up until 16 came with the hole drilled all the way thru. The hole didn't bottom like on later Ts. You remove them by using a hammer and drift. 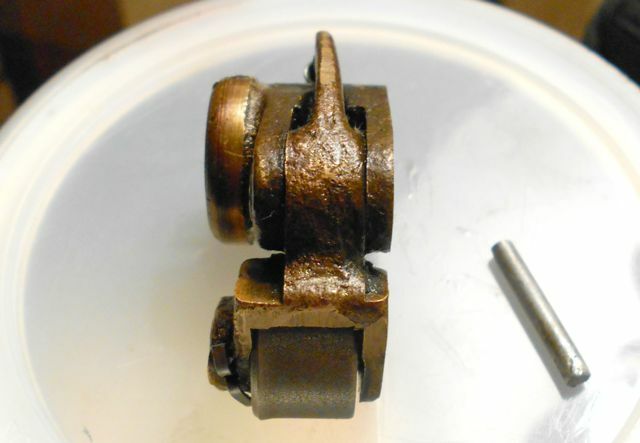 If yours is a later camshaft, someone apparently used a short pin without the head as was mentioned earlier. Richard, you are absolutely right. The other end of the pin was hidden under the little rotating drum. I used a hammer and awl and it popped right out. 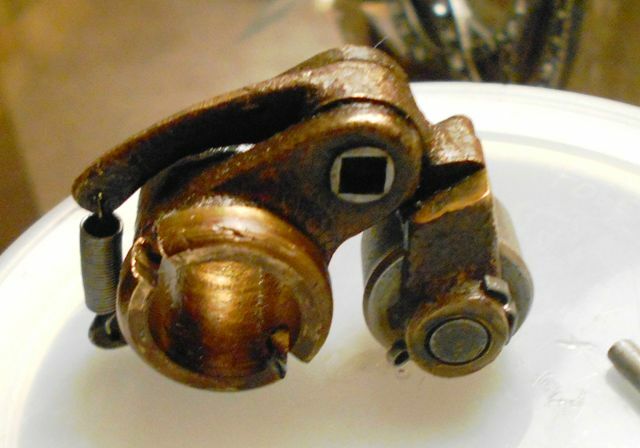 Will take close-ups of the roller and pin later this evening (dinner is served). Bob, does the pin go completely through the camshaft? If it does maybe you can tap it out with a small punch and hammer. To me it kind of looks like the brass thing around the pin is a separate piece from the timer roller. 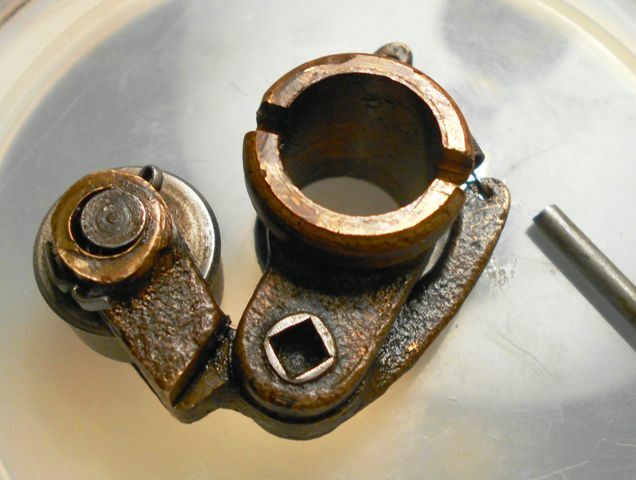 Maybe stick a flat screwdriver under the "ring" near the roller arm rivet and give it a twist. Does the ring move? Bob, you type faster than I do. Bob, If the hole goes through make sure you get the roller on right otherwise,it will be 180 degrees out. You'd be amazed at how often that mistake is made. Unless the pin is shorter then the hole or if the hole does go all the way through, tapping on it may not do any good as it would have no where to go as it may be bottomed out now. If the hole in the cam shaft does go through you may have to cut a slot on the other side for it to come out. Those round pictures give it an old time look! 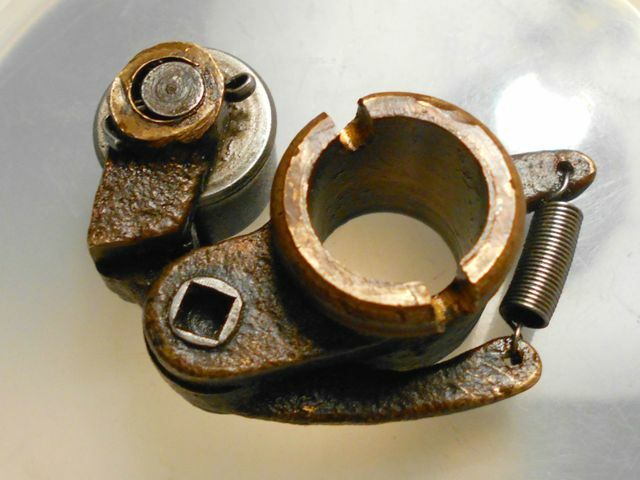 some of the photos is what holds the roller to the camshaft.-Like I said, oddball. should be toward the fanbelt. 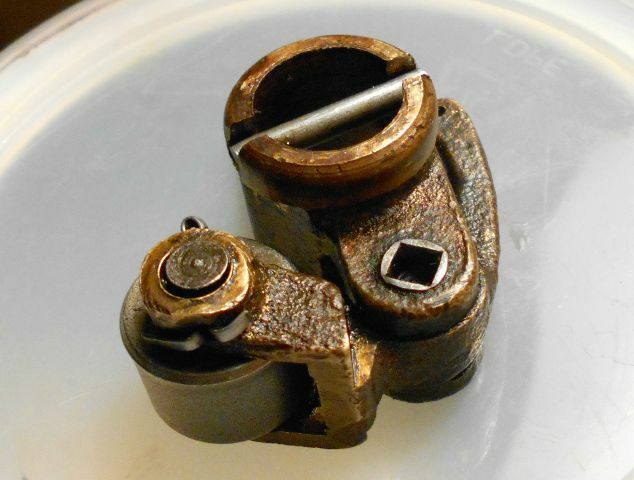 Does that timer pin have an interference fit in the camshaft hole or in the roller collar (or both)? 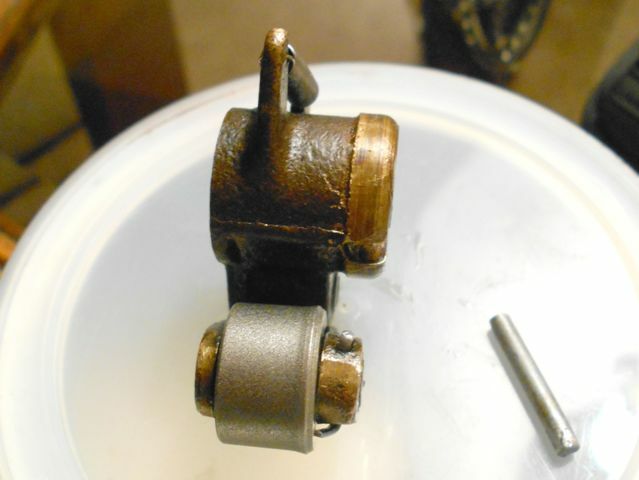 The retaining pin has no head and, I suppose, it could be inserted from either side of the roller. -I pushed it in as far as it would go on finger power and used a wooden drift and a small, ball-peen hammer to whack it in the rest of the way. -When in place, the pin doesn't protrude from the roller at all. 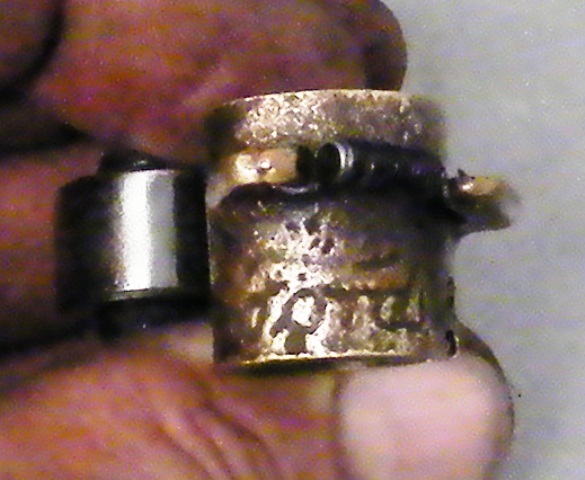 -Then the collar-ring went on, and of course that makes it impossible for the pin to move. When I had the roller off, I noticed there was a modern, neoprene seal behind the brass shield. -In my case, the modern seal doesn't seal very well and the timer's insides get slimed up pretty frequently. 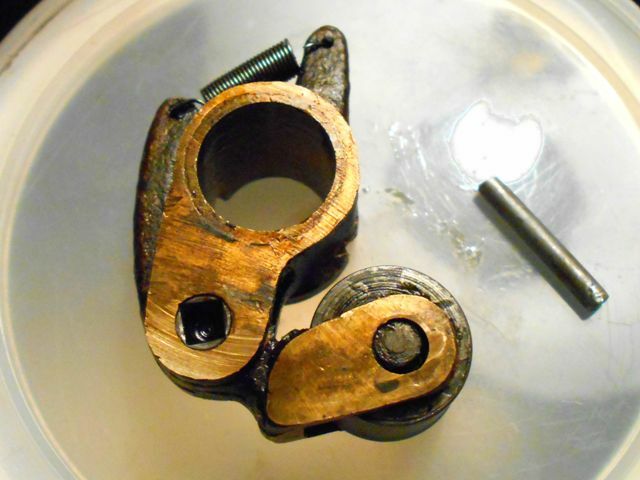 -I had an old-fashioned, felt seal, but it was necessary to slice that in half and compress it in a vice so the roller could move far enough aft on the camshaft to expose the retaining-pin's hole. -Of course, I had to use a brass shield with the felt seal. 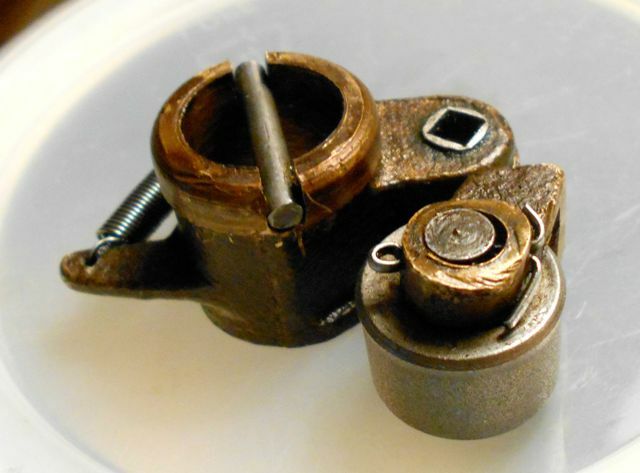 Your timer roller appears to be one of the earlier variations of Ford part # T-4481 (Commutator Head Assembly} used Circa 1911-1921. Indeed, the roller in Bob's picture is the standard roller used from about 1912 - 1917 or thereabouts. Those are great rollers. Not odd at all. These began to be marked with Ford script around 1916. Bob, the roller must be flopping all around with all that wear. That is an early roller that is well past it's useful life. I don't know why they would have used that on your car but it might be that it aligned better with the timer contacts than the later style. Be sure to check the alignment when you put the replacement on. Sometimes the roller needs to be shimmed or ground down to get the roller lined up correctly with the contacts on the timer. 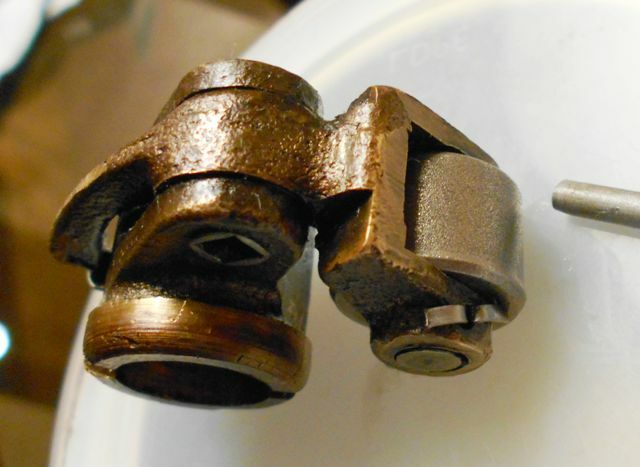 The upper one is an original with the actual roller removed. The lower one is a Howard Cascia reproduction. Howard made them a mirror image of the originals - why, I don't know. Up to the present, this early timer has given me pretty good service, even in spite of wear and clearances having opened up quite a bit. -The "track" inside the aluminum housing is a bit bumpy, too, so it's probably time to take the whole mechanism to a machine shop for overhaul�assuming I can find one willing to do that kind of work (after the end of the driving season, that is�I've already lost all of August to my balky ignition system). Does anybody know where I can purchase an identical timer?